Built to rule the ocean. 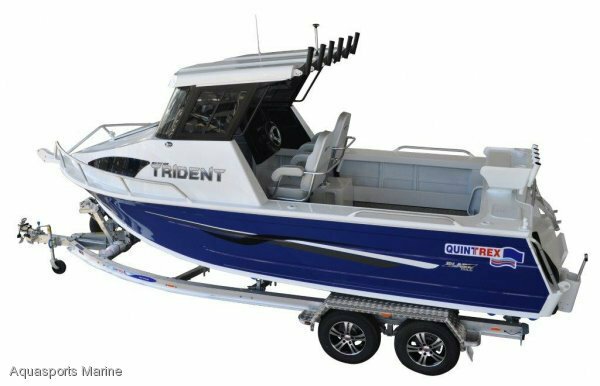 The Trident is Quintrex's first range of offshore fishing models to feature the Millennium Blade Hull constructed from tough 5mm plate bottom sheets. 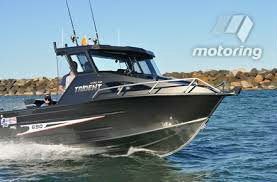 The 650 Trident Hard Top design means you can enjoy your boat in all weather conditions, with a laminated hardened glass windscreen, sliding side windows and a standard windscreen wiper kit your view is never interrupted. This is a serious offshore rig! We will be packaging this boat with the New 150HP Mercury EFI 4 stroke 3.0 litre motor and with 3000cc of power this will be one good looking rig with Quintrex new Vinyl Wrapping! Stainless Prop, Smart Craft Digital gauges gives you your fuel burn diagnostics. 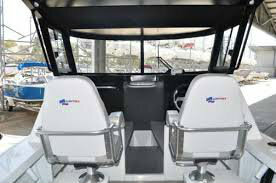 Your choice of Lowrance electronic units, GME GX600 VHF Radio, Navigation Lights, Twin Bilge Pumps, Folding Rod Holders off Rear of Hardtop, Led Lights off Hard top and under gunwals/inside cockpit, Windscreen wiper, Sliding side windows, Seat Boxes with Storage, Live Bait tank with Clear window, Trim Tabs, Welded Rod Holders in gunwale, Blade Hull, Twin Batts, Transom Door, Cutting Board, Kill Tank, 180l fuel tank.